Following up the first installment of the update, HMD is currently rolling the second OTA for the stunning Android 8.0 Oreo Beta update for Nokia 5. It comes with firmware version number v5.160. The changelog for the Beta 2 is pretty much the same as that of the first Oreo beta fro Nokia Labs. It includes all the cool features of Oreo like Picture-in-Picture, Autofill for passwords, notification dots, etc. 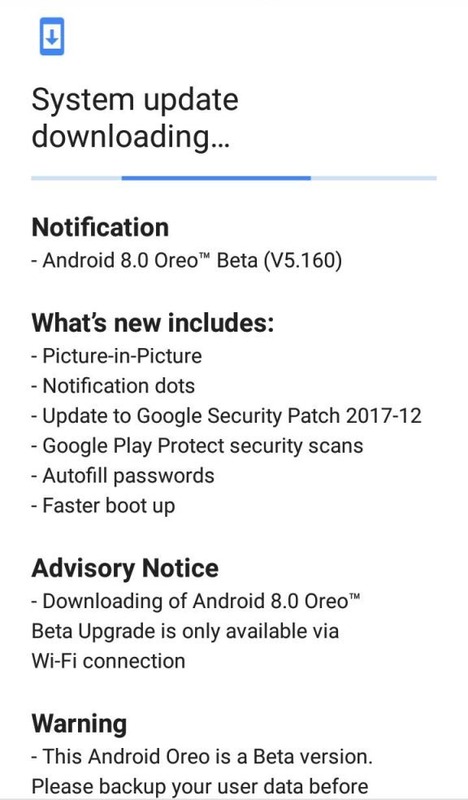 The OTA update also features the December 2017 Security Patch and brings Google play Protect Security scans as well. It also fastens up the boot time of the device. You can see the features this second rollout of Android O brings for the device. In the numero uno upgrade, camera app was redesigned, Nightlight feature and change in the swipe up gesture for opening app drawer was added. This aforementioned update for Nokia 5 weighs around a massive 1.6GB. This package is rolling in waves, so it will take some time to reach all devices around the globe. Earlier this month, HMD announced of the Oreo enrollment through Nokia Beta Labs for its various phones. You can receive the OTA if you have enrolled as Beta tester. You can manually check by going to device Settings > System updates and if it available then install it. It is a large update so we suggest you to download it from Wi-Fi network. So, sign up for the beta Labs to avail the Oreo for your phone. If you’ve already applied then expect the update. Follow AndroidSage for all latest updates on Android O updates for all Nokia devices.